There is one thing I know about this record and that is that it is from San Francisco. I found it in San Francisco. 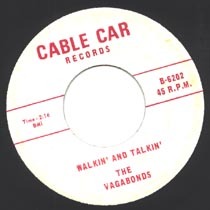 The label is named Cable Car Records. Verdict in: San Francisco. Everything else is a guess. I am pretty sure that the group is African American. I would also guess that this was recorded in the late 1960s or early 1970s and was sold by the group at their gigs, probably in some lounge or several lounges, to tourists. The A-side is the kind of jazzy vocals thing that would go over at some nightclub, something Herb Caen might have mentioned in his column, after a night drinking. The flip, though, is where the action is at. "Walkin' And Talkin'" is a slow, creepy R&B number...and creepy for a number of reasons. First is the woozy beginning, a hypnotic stagger. Then the vocals come in. They are less singing and more of an intoxicated, faux-playful threat. The phrasing is weird and spaced far apart, as is if the singer needs to focus on his subject before going off. Toward the end of the song, it gets a normal R&B groove, but even that is strange. Why now? I am pretty sure that "Walkin' And Talkin'" was a made-up-in-the-studio throwaway, some slap together thing made to fill the B-side. However, like a lot of unintended B-sides (Rosie & the Originals' "Give Me Love" being the most noteworthy), it is the flip that makes the record. I was just going through a "to sell" pile and I came across this great little gospel single. Why was it in the sell pile? The first time I listened to it I must have been on drugs...a ha ha ha ha ha ha ha ha ha ha ha. I crack me up. No really, just looking at the label, you know this has potential. The artist not only named the label after himself (now, who would do a thing like that), but he turned his name into a place! My god (no pun intended), that is genius. Sorianoville Records. Huh? Has a nice ring to it, doesn't it? When I dropped needle, I knew I that this had to go from the "to sell" pile to the "to keep" stack. A nice raw, warm recording of a guy, his voice, and his - ahem - organ (badda bump, thank you, thank you very much, you've been a great audience). 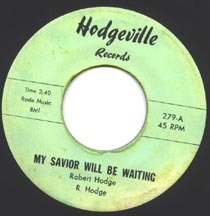 Hodge's voice is good and his organ style is unique. He accents and wanders, the settings go from a piano-like clank to an electric organ weeze. Really cool stuff. Who the guy is, where this was recorded, I have no idea. I do know that he made another 45 for Savoy. 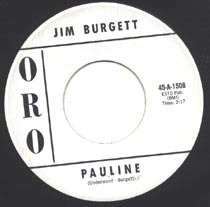 I really don't know anything about Jim Burgett other than he was from the San Francisco Bay Area, made a handful of rockabilly singles in the early 60s, and produced a few Frisco hippie bands some years later. I also know that he made this proto-garage punk, rockabilly stomper! Listen to that dnh-dnh-dnh-dnh-dnh-dnh-dnh-dnh between the lyric lines in the verse and how it turns up in every artist from the Kinks to the Seeds. I am sure that Burgett didn't invent it. Hell, it's a simple blues convention used by Willie Dixon (and punked out by Link Wray). But it works and here it is. 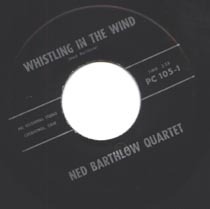 The Ned Bartlow Quartet takes what could be a pretty mundane song and unintentionally makes it very eerie with one simple sound effect. Right as the song starts, a hollow hiss begins. It is supposed to be the wind, but they either used a bad recording or tried to approximate the wind with chintzy electronics. Whatever the case, the sound is unsettling enough to affect the rest of the song. It makes the organ a bit more Carnival of Horrors and the vocals become disembodied. The wind effect is not only a perfect example of how one thing can change the whole nature of a song, but of how different sounds interact with each other. I doubt whomever produced this record thought of that when recording "Whistling in the Wind." I am sure they thought that they were just introducing a neat sound effect and that was that. I also expect that the producer/engineer were just recording a song. Ned Bartlow and his boys were there for a few hours and played the thing a couple times. They took the best take and Jimmy said "Hey wouldn't it be neat to have the sound of the wind in the background," and that was that. This wasn't Brian Wilson on mix number two hundred seven, desperately seeking the perfect sound. If it was the wind would have sounded like the wind and I probably wouldn't be writing about Ned Barthlow's creation. Randomness and chance are wonderful things.